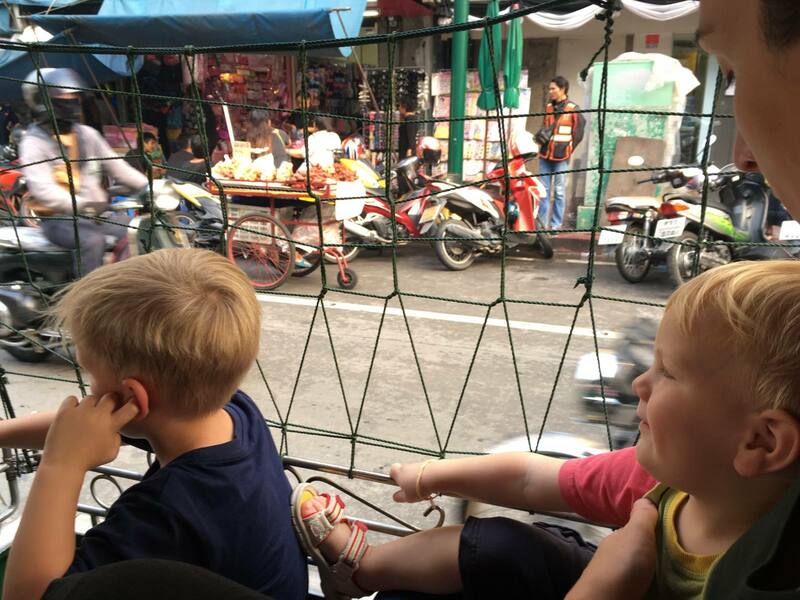 You are here: Home / Fun Outdoors / Travel / Rest of World / Should you go to Bangkok with young children? 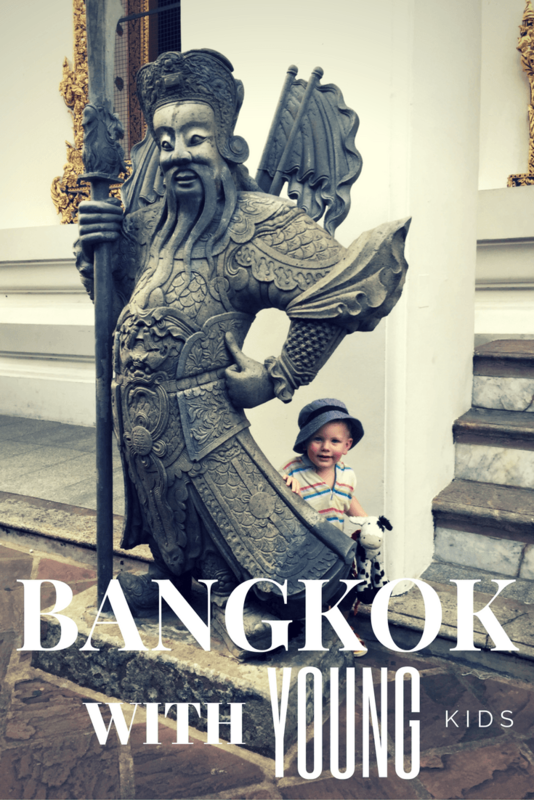 Should you go to Bangkok with young children? 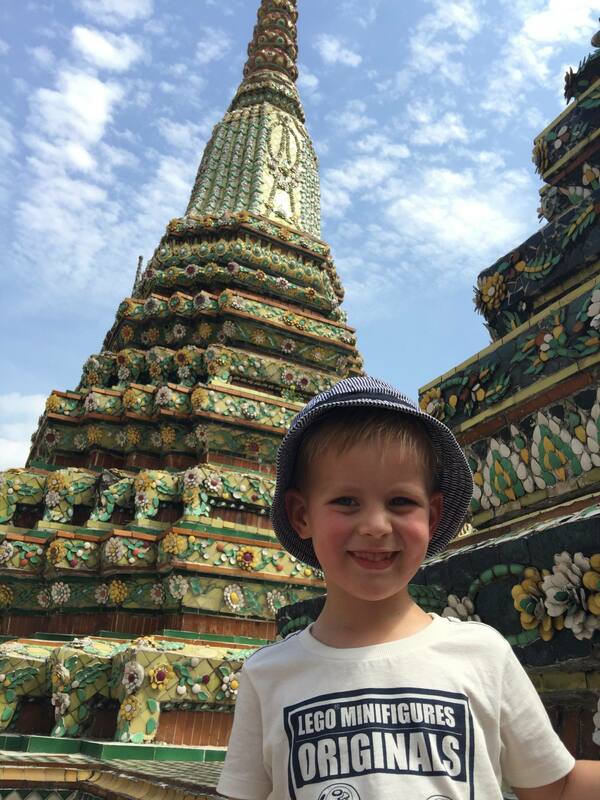 I have just returned from a great trip to Thailand with our family, including James who is 4 and Noah who was 23 months old. We spent 3 days (4 nights) in Bangkok at the beginning of our trip and thought it might be helpful to share some of our findings of this city for those who may be considering visiting Bangkok with young children. We stayed at the Royal Princess Larn Luang, which was about 35-45 minutes from Suvarnabhumi Airport. We found this hotel to be well located, and had a lovely cool pool, which was very welcome after a long day in and out of boats, skytrains and the along the buzzing streets of the city. Should you take a pushchair to Bangkok? Firstly I will share that everything we read (and I read and researched this a great deal) before we went advised that we should not take the pushchair; we were warned that the footpaths in Thailand were poorly maintained, often disappearing in a pile of rubble, and people shared stories of having to abandon their stroller in the street due to finding it too difficult to carry a child over the rocks. So, we left our beloved Phil & Teds double behind in the UK. Bad move. Bad move. Although I hired a preschool-sized Solarweave Connecta, Rob decided his back couldn’t take James’ weight for more than a few minutes, and so we endured whinging and whining while we cajoled our four-year-old about the city. Of course I carried Noah on my back in our toddler-sized Solarweave Connecta. If I could’ve tandem carried, I totally would have, but a combined weight of 30kg extra is a little bit too much for long. 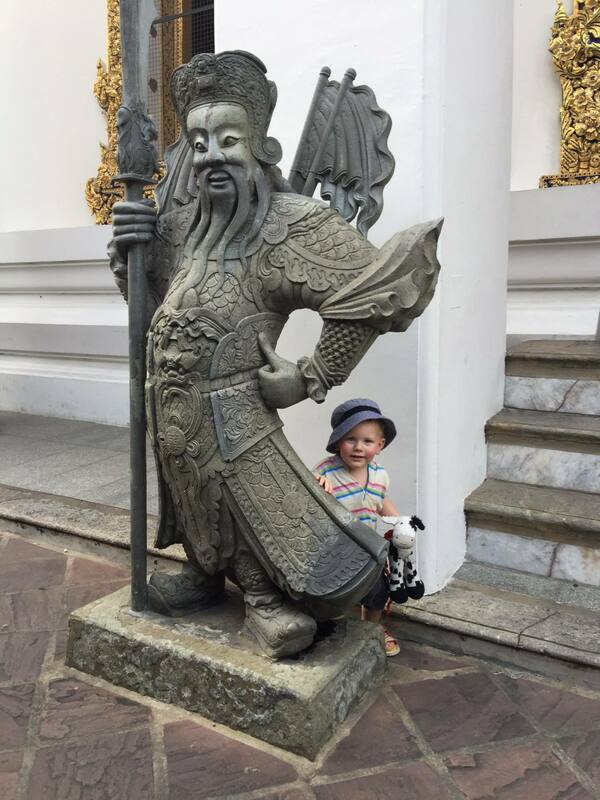 If you are wondering if you should take a pushchair to Thailand for your toddler or preschooler, you absolutely should. I would take a lightweight, foldable stroller, or a P&T. Bangkok, especially, is no different to many European cities, and your stroller will cope admirably. Many streets were not really designed for pushchairs, so I won’t deny that there will not be challenges, but it was doable and we regretted this often. Getting a lot packed in with a walking preschooler is difficult, so we tended to focus on doing one big thing a day, and anything else was a bonus. Getting around the city worked out reasonably well. 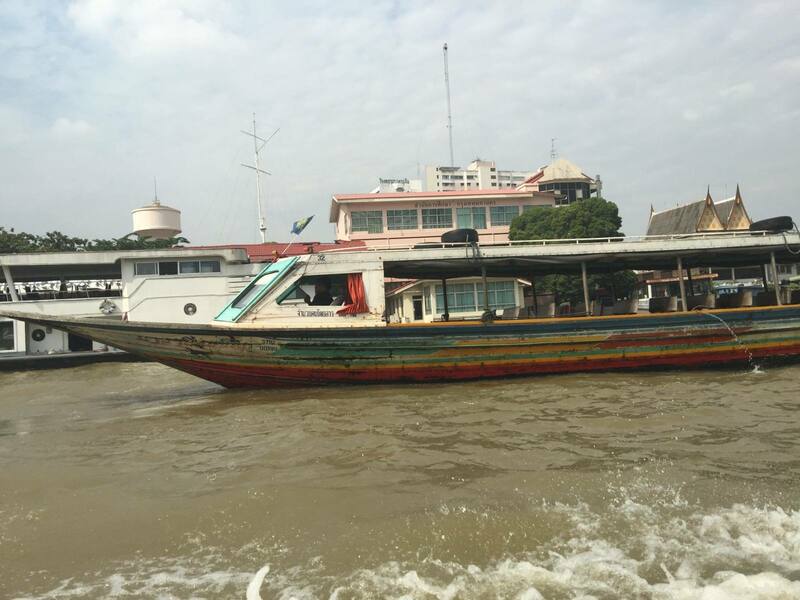 We used the skytrain, metro, express boat and tuk tuks. Noah’s favourite was the tuk tuks, and he would be really sad to find out that he slept through our longest journey in one. To be honest, I also read about this one before we went away too. Many sites warned of the dangers, screamed about the lack of car seats, and generally made me fearful of the consequences of riding in this type of transport in Thailand. 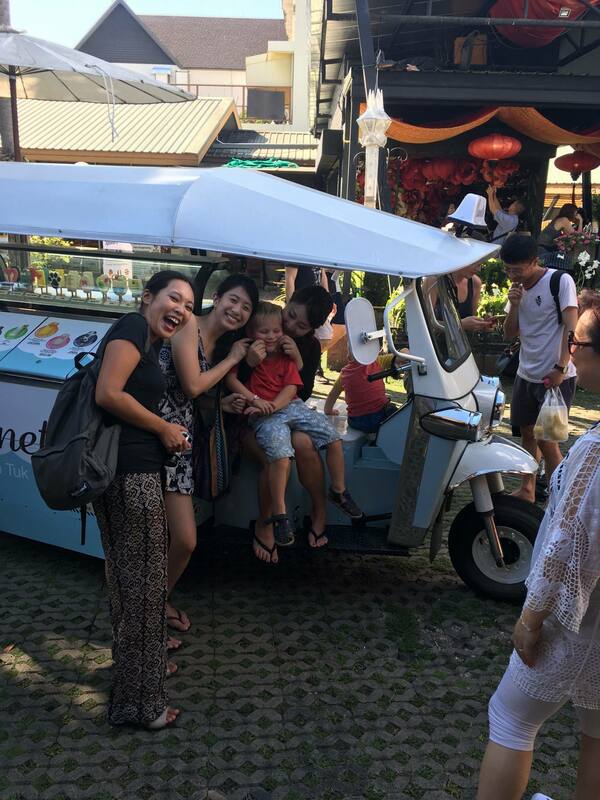 Well, should you take young children in a tuk-tuk? I don’t see why not if they’ll sit down for the journey. There are no sides, or some tuk-tuks have one netted side and the others are wired ornately. So if your toddler doesn’t sit still it could be dangerous. But the traffic travels at a decent speed, and the drivers are respectful of pedestrians, bikes and tuk-tuks. We didn’t feel unsafe (in fact if you were in Bangkok for a long time, you might feel the most dangerous element of riding in a tuk-tuk is the fumes you’re inhaling). People, in general, were incredibly accommodating of us. Almost all the restaurants had baby chairs for Noah, and there were menu items for our children to eat, and staff in restaurants were very friendly. Most wait staff spoke English, and the menus had English descriptions, or photos and an English translation of the name of the food. Something I really wish would happen a bit more often in the UK (although I’m not sure I would be as trusting at home) was a bit of a village effect. You know the phrase – it takes a village to raise a child – and I found that if there were occasions when I was struggling with the boys there would be a very friendly face swoop in and help me out. For example, if Noah was sleepy and I was trying to eat, instead of having to balance him on my knee the waitress would come and entertain him. He was hand fed a banana and a glass of milk on a couple of occasions, and often, in the morning in hotels, he was simply walked around the restaurant while I was selecting my food from the buffet. We found that our children were like little celebrities, and everyone wanted to say hello, and have a photo taken of them with the boys. 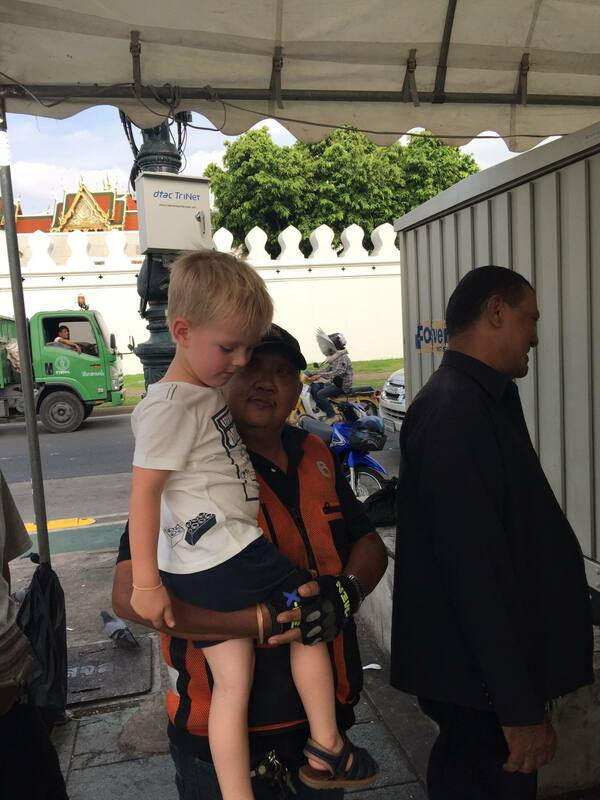 The Thai people are gentle, and although it seemed very strange to us (why would you want to have photos of a random child?) they were very polite but keen to get a photo. Noah was fine, most of the time, with this. James, however, needed a bit of encouragement, but often opted out. Following the death of the King of Thailand, there were crowds of mourning Thais, dressed in black, in huge processions and queues in places around Bangkok, and especially at the Grand Palace. This also meant that there were welfare stations around the city, offering free food and drink to passers-by, including us. We were cheerily waved over to the stalls, James first, and cartons of milk pressed into our hands, or packets of Oreos, sachets of sweets, and little bottles of water. Once James was grabbed by the hand and pulled into a queue. The man smiled and indicated he would be okay. We looked to see what everyone was waiting for – a big barrel full of coconut ice cream. James was cuddled while waiting, and his reward was a cup of delicious creamy cold coconut ice. Immediately afterwards, he got a bit annoyed because many people had seen him in the queue and wanted a photo with him, too. He just wanted to eat his ice cream, understandably. But after a couple of snaps with military personnel, he tucked into his yummy surprise. Two of our favourite places in Bangkok for the kids: the Golden Mount, which was just around the corner from our hotel, and up 334 steps with bells to ring along the way; and the shopping mall Siam Centre. 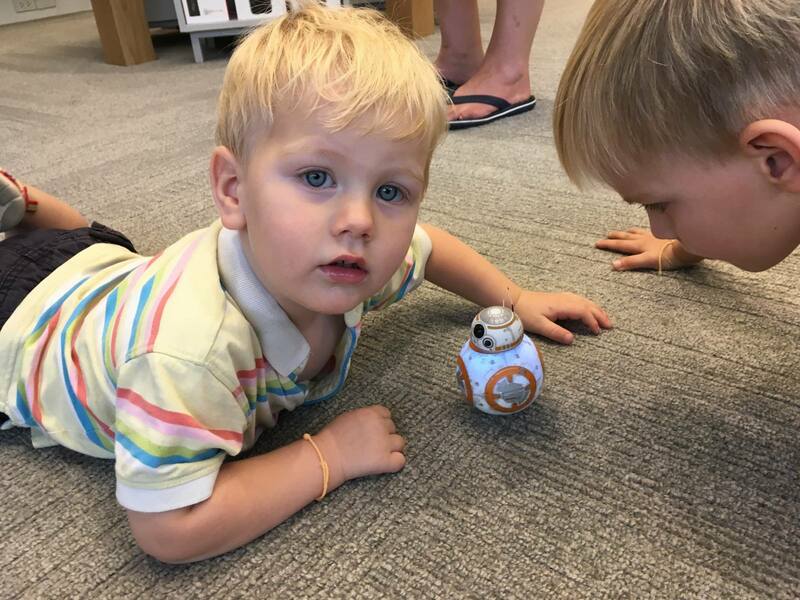 In the latter, the boys were wooed into a shop with flying drones and a gesture-controlled robot. They spent so long thoroughly enjoying themselves here, we felt we probably wouldn’t top it by going to the aquarium! Least successful was probably Bangkok’s Chinatown – we thought this would be where we could find cheap items to buy for souvenirs or toys for the boys, but almost all the stalls we saw were wholesale only. We all really enjoyed Bangkok- it’s a fascinating, buzzy, energetic city, and we also felt safe there. People were incredibly friendly. Despite some worries beforehand, it WAS doable with two young children. Yes, there were challenges, but they were easily overcome, and didn’t take away from our enjoyment of the city. Even at 23 months, Noah enjoyed the sights and sounds of the city. 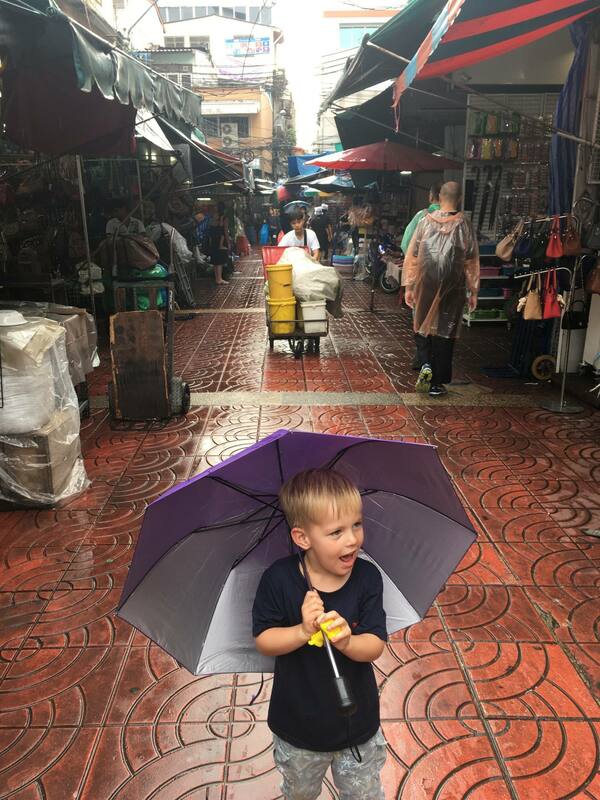 My advice is that Bangkok is a great city – “lugging” a toddler around is well worth it to take it all in. Loving the new theme and banner! I admire you for taking 2 under 4 to Bangkok! Very impressive. Shame about the stroller, bet you guys were kicking yourselves. You’ve not been round here for a while! Haha! You missed a fab month of brilliant guest posts then – have a browse http://babyfoote.com/tag/guest-post/ Some of these are right up your street. Will do! Sorry about that, they must have missed my feeds entirely! I would absolutely love to go to Bangkok. So great that everyone seemed so friendly! So strange that everyone wanted pics with them! We have yet to visit Thailand but it’s definitely on our to-do list now, especially after reading your post. BattleKid is 3 now and we’re trying to instil the travel bug in him from am early age. He’s been as far as New York and this year we’re taking our longest flight with him to Portland. So if we survive that, a flight to Thailand will be a breeze. Bangkok is definitely on my bucket list. What a wonderful city and an amazing adventure for your wee ones. Delighted you had a great experience and what a story for the little ones to tell when they are older. I want to go even more now!